Home / Columnists/ Caesarean Republicanism: The silence of the lambs? Caesarean Republicanism: The silence of the lambs? Shall the taxpayer have to see and bear a reinstitution of the lionising of local politicos that was par for the course under the previous Caesars? A funny thing happened on the way to the UNGA forum. Caesar’s wife was invited but couldn’t go, so Caesar’s son went instead – and what chaos ensued. Hell hath no fury like a newly democratised republican polity spurned. At least, on social media, where those outspoken pioneers of citizen-journalism lurk and work. The mainstream press – some early adapters to recent game-changes in now permissible political commentary – chipped in with a chorus of suitable outrage. After all, wasn’t it to bury nepotism that all of us (whoever that ‘we’ might be, these days) voted this then-loudly-praised and now-highly-lamented lot in? The thing about that nascent critical streak against one’s governors is that it has a life of its own. What begins with nice healthy critical engagement of the powers that be in regard to their more recent lacunae degenerates soon enough into a cynical exercise in accusation and reproach over a veritable litany of past and present misdeeds. Who forked out nine million quid for Caesar’s triumphant return after vanquishing the inquisitive diasporic Vandals and the galling global-police Goths at the UNGA forum? (#meme) Shall the taxpayer have to see and bear a reinstitution of the lionising of local politicos that was par for the course under the previous Caesars? (#jungle telegraph comment) Did this imperator – who’s more of a stuttering Claudius than a strutting Julius – mean it when he vowed to return the state of our nation to democratic-republicanism from the despotic banana-tyranny it once was? (#my own interpretation of the issue at hand) Exhuming the poor tortured sportsperson’s dead body was a cynical electioneering ploy, was it, notwithstanding moving speeches about human rights for all Sri Lankans at the UNGA forum? (#Facebook comment) Cheating on constitutional amendments, skulduggery over the state of law and order, statistics on the economy and damned lies... (#conventional-wisdom tweet) The bad that men do lives after them; the good is oft interred with their bones (#classical quote re-tweeted) – So with this Caesar, about whom neither mainstream nor social media has a nice thing to say these days... (#me again). With that said, the most pressing present concern for me is not about what lies buried in the archives of our country’s recent past... war, war crimes, warts and all. There is a sense that our island in the sun has emerged from under the darkest clouds it was once under, and will (sooner than later, and in some form or another) be absorbed into the mainstream of global democracy once again. There is also the sense that whatever emerges from the UN forum and the internationalised mechanism to lick our war wounds locally, there will always be the feeling that >one man’s hybrid mechanism will be >another woman’s hysterical mother demanding justice or a dead body to bury or both or >a child’s hysterical mewling and puking in its parentless plight. War is hell. War reparations are often worse than the crimes committed in the name of restitution, restoration, reconciliation. This is not the first time that highly politicised arguments on how to secure a just and lasting peace with equity for all and amity by all has been botched by lobbies vying for political victories to present to their electorates. This is not the first time that a chronic inability to hold justice lightly in one hand and mercy tightly in the other has seen opportunities squandered for our blessed islanders to own up to past mistakes made and own the future prospect being held out so tantalisingly out of reach. Because we will not judge right and still forgive that wrongdoing. This is not the first government that has promised ‘justice’ – whatever that might be and mean – for the families of Lasantha and Prageeth (the better known names among a battery of a myriad nameless faceless victims of civil war and sociopolitical warfare). It won’t be the last... not in a long while – for realpolitik usually takes precedence over virtuous manifestoes and noble electoral promises once reality sets in. Power (which tends to corrupt) corrupts the best among us into thinking that the office sanctifies its holder and that great men are necessarily good men. But even by the most cynical, sceptical, lying low-life standards, a government’s word on its intended and expected standards of governance must be as good as its bond (no pun intended). A good government’s bond to the standard of good governance it embraced and espoused must be better than its words (which is what the unrealistic public still expects). And even if good governance remains as silent as the grave on the truth about that noble ruggerite W. Thajudeen, Esq. (the good that men do being exaggerated highly in the event of their sudden and expedient demise) among other miscarriages of governance, it must be less sepulchral on the ghost of nepotism. It is a ghost that walks the land again, in the person and work of its erstwhile Caesars (we can’t forget that today’s Caesars were once Czars under the previous regime) and their emerging ethos of neo-Caesarean republicanism. It is one thing for an ambitious despot of the past to flout the norms of democracy and present the fruit of his loins as the potential future lairds of the land. It is quite another for an aspiring democrat of the present to act as if imitation were the sincerest form of flattery. We haven’t quite forgotten that the Claudius Caesars of this world once paid homage with the fruit of their lips to the Julius Caesars of the ‘ancien regime’. *Supreme Saviour, *Sovereign Messiah, *Lord and Master-Deliverer* being among the epithets of choice if memory serves! Must action now mimic and follow upon flattery? Do we not deserve better than this lowly abasement of those lofty standards which were hymned on the campaign trail against cronyism and corruption, only to find the same red carpet treatment being meted out to another scion’s legions? Even now an apology would be in order! Even if an explanation alone would not suffice, leave alone a high-handed dismissal of accusations! 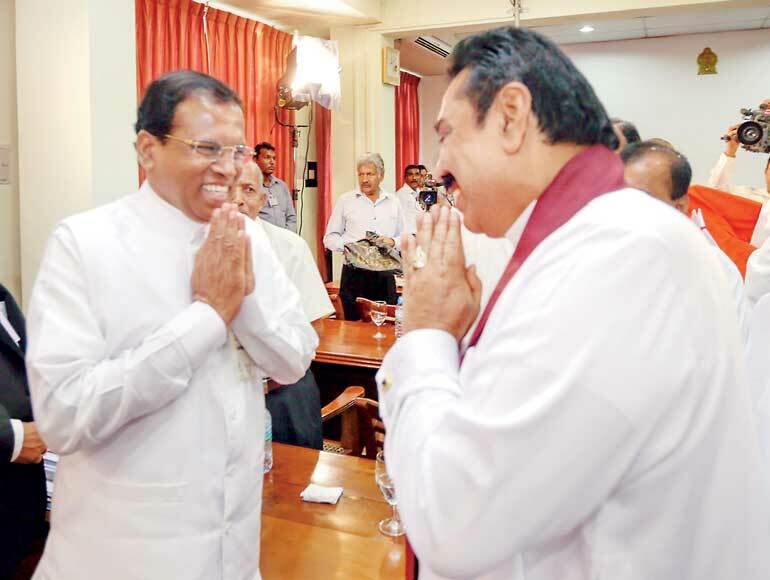 Can Caesar’s co-governors attempt an attenuation of circumstances, or are we to assume that even they are cynically or strategically or even helplessly a part of the slump in the present dispensation’s probity? This take on The Silence of The Lambs must assume that the main players in the Good Governance camp remain silent because they see no harm in the shape of things to come. To err is human; to let it go is good natured. There are more important things to worry about: such as war crime issues and a sustainable macroeconomic policy direction to set. The safe bet and fond hope is that the polity will find it in their hearts to forgive this small misstep made by a man with a larger vision for our nation. To keep mum on some of Caesar’s simple misdemeanours is the best course of action to take or not take! CONVENTIONAL WISDOM: Not an important issue. Let it be. DEVIL’S ADVOCATE: Don’t be naïve. It’s too important to ignore. This point of view is more tactical than honest and sincere. It accepts the liabilities that being part of a vast and varied coalition government brings. There will be some fallout from some proponents of Good Governance talking but not walking the walk. To err is human; to let it be and let it pass is good politics in its better form. The art of the possible is to duck or run for cover when the big guns are firing like loose cannons and rest assured that the polity will be certain to forget about it in a month’s time, anyway. To neglect Caesar’s ambitions in the direction of privileging his progeny at international forums can’t hurt too badly in the end. CONVENTIONAL WISDOM: Hope no one notices. It too shall pass. DEVIL’S ADVOCATE: Too late. Everyone has something to say about it. This perspective is arguably the worst of the lot. It assumes that the savvier factions in the Good Governance machine don’t mind a few faux-pas along the primrose path to deceiving the public about the true character of the Caesars it supports and enthrones. In fact, it secretly welcomes it. It takes away some unwelcome attention that would otherwise be directed on the handling of the hybrid mechanism to investigate war crimes and the mediocre handling of the economy in the face of internationalist pressure to begin subscribing to a global agenda again. To remain silent might fuel speculation about the delicate power balance between the presidency and the premiership; but not so badly as to undo the progress being made where it really matters to a small coterie of the powers that be, not necessarily the republic at large. CONVENTIONAL WISDOM: It is the very thing we feared would come true. Let’s make the most of an impossible situation to address. DEVIL’S ADVOCATE: Nip it in the bud – now. This all too realistic realisation comes not to the powers that be, of whatever stripe of Caesarean republicanism, but to the public – the <res publica> (Latin trans. : ‘this thing of ours’) – which they ostensibly represent. We have seen and known that power tends to corrupt, and that absolute power – even it its ersatz forms – tends to corrupt absolutely. Or, now that the executive has had its wings clipped by virtue of constitutional wrangling, prime ministerial workmanship, and parliamentary oversight, “relative power also tends to corrupt, and relative power corrupts relatives relatively” (which is not as funny as it sounds). So, is this the ineluctable shape of things to come for our newly shaping up democracy? Is this the inevitable truth about the neo-oriental monarchism that even our neo-Caesarean republicans cannot deny or prevent? Is it in the nature or the beast to slouch towards a benevolent nepotocracy to be born again? Or will a repeat of the beating of the breast at public expense in an open display of private power in the environs of Polonnaruwa by Pharaoh’s daughter be still-born? And will the explanation and/or apology of the Prince of Egypt or Persia or whatever oriental monarchy we seem to want to emulate these days wash with the Premier and his cohorts? CONVENTIONAL WISDOM: It is the way of all flesh. The more things change, the more they stay the same. Be this spectrum of possible interpretations as they may, there is no gainsaying that there is a new look and feel to the state of the nation today. Much of it is pleasant. Some of it is spectacular. But only naive and sentimental lovers of noble ideas like Good Governance will deny that in the limit of its practice, there is still – or now – a consummation devoutly to be wished! We – together with the rest of the powers that be – can bury our heads in the sand in the same breath as we are evidently willing to let the dead bury their own dead – and pretend that we don’t have a potential problem. We can put it down to chance, coincidence, or happenstance; or we can sit up and take notice and realise that the trajectory of good governance has changed – by design or by default it is possibly too early to say. My point is it happened once and we all looked away: first by choice, then by compulsion. My fear is it could happen again. My feeling is that the rot has started. My thinking is it is easier to nip in the bud – now.